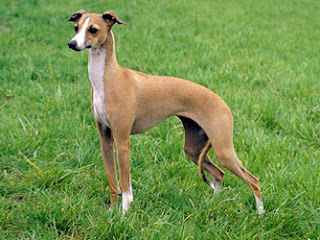 The Italian Greyhound, also called I.G. or Iggy, is a small breed of dog of the sight hound type and was developed by the Romans. It was a favorite breed among Catherine, the great of Russia. It is a friendly breed and thus a wonderful companion. It can cause great damage but is very humble and shy. If treated in a tough manner then it can become sober and thus soft handling is a must. The Italian Greyhound is a dependent breed and will do well if kept as a friend. They are very sensitive and need repeated assurances that they haven’t been a bad boy. It is also commonly used as agility trials because of its lively and fast nature. Italian Greyhounds is a fearful breed and thus small children that trouble him are sure to make him more timid, also it gets easily scared by large dominant dogs. As a result it does well with a family having mature children and may also get along well in the house having a number of Italian Greyhounds. Grooming of Italian Greyhounds is very simple because of the fact that it does not shed much hair and simply wiping with a soft towel can be done to keep it in good health. However, the teeth must be brushed regularly to avoid gum problems and nails should be clipped every other week. On the other hand it’s a challenge to train the Italian Greyhound because of their sensitive and hyperactive nature. Often professional training is necessary for this task. The breed must be given regular instructions regarding obedience because they have a nature to become timid if treated harshly. It is a very lively breed and thus requires strenuous exercise on everyday basis. He loves jogging and running and long walks. Therefore, they do well in a house which has at least a small yard to give them leisure space. It must always be kept tied within a fenced area because otherwise it may run away because of its love for exercise. The life expectancy of Italian Greyhounds is 12-15 years.